We are bringing in the summer fruit, Summer harvest, like the winter harvest reminds me of childhood Christmases in England. Our fig trees are heavy with higos, the second crop. These figs are the little sweet fruit, very different from the fat watery brevas of spring. Judy sterilizes them in boiling water for a few seconds, threads them on wooden skewers and hangs them from our clothes horse to dry. I remember summer figs as Christmas treats, squashed into a box and dusted with something white that wasn’t sugar. Flour I think. 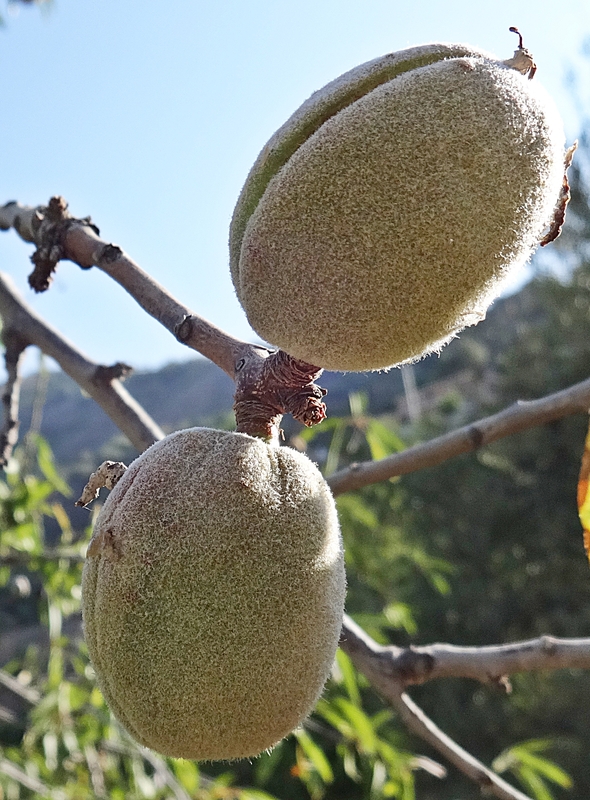 Almonds are also ready and here in the hills they need to be picked immediately at the height of the summer heat when the caulk splits back to reveal a fat wet nut inside. If you don’t shuck almonds as soon as they are ready, even a little shower of rain will make the case roll back over the nut and stick to it like glue. Then it’s hell’s own job to get the nuts out. My childhood memory is of the Xmas mixed nut bowl that consisted largely of almonds mixed with walnuts hazelnuts and Brazils. Pistachios and other posh fripparies were unheard of. A child’s hand is not strong, so you hoped for a walnut that would shatter satisfying under the crackers. Failing that a hazel nut, and finally you could try several Brazils in the hope that one might split and you could pick out the meat with a fork. Almonds were hopeless. You might as well try to crack a steel nut on the end of a bolt. If Uncle Fred came round on Boxing day, he might get your Dad’s four pound claw hammer and smash almonds in the kitchen, against one of your Mum’s delicate working surfaces, which never looked quite the same again. By the time you took the decorations down and everything had gone – the Cadbury’s selection box, Huntley and Palmers’ mixed biscuits, peanuts and raisins, dates, dried figs and the mixed nuts – the almonds at the bottom of the bowl remained. Mum would decant these into a smaller more decorated bowl and put them on the side until about June, where they attracted spare stamps, hair grips, paper clips anonymous keys and the like. She would then dust them down and slip them into a paper bag next to the spare crackers and serviettes, ready for next Xmas. Like people, almonds get harder with age. 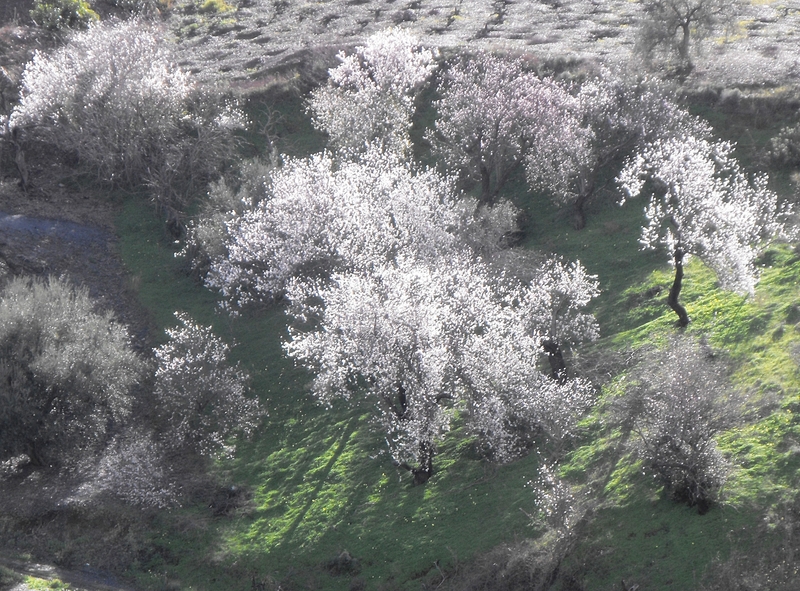 The ancient almond trees on our parcelas however, are good as gold. The trees are typical of the mixed fruit landscape of the Axarquia and stand out clearly with their soot black trunks. In January and February these are smothered in white or pink blushed blossom that shimmers and blows in the winter winds. 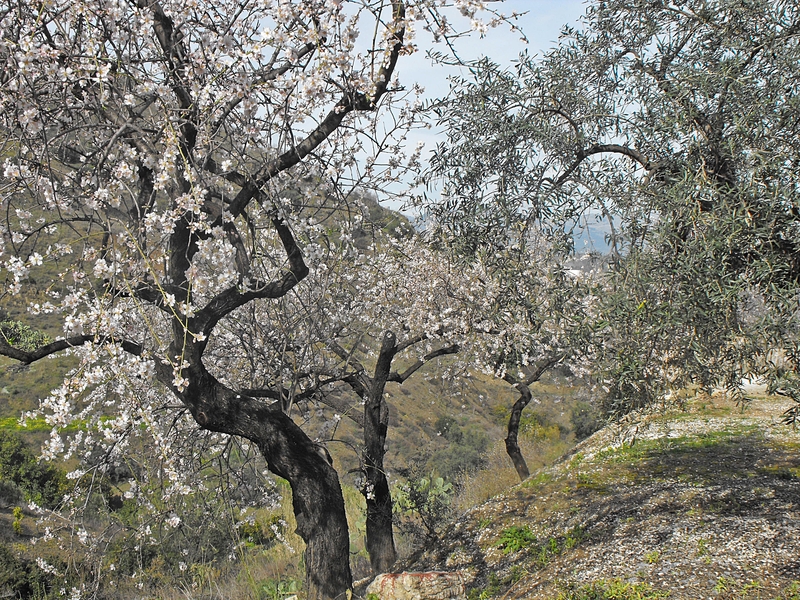 The early blossom is vulnerable to hail and heavy rain bursts, however the Axarquia is more or less frost free so these cold-tender trees do well on more or less any terrain that’s well drained. They grow on the steep upper slopes where not much else will grow and while they respond mightily to a little TLC and some water, they don’t need it and once established will survive and produce on their own. The almond is a tree of Chinese origin that spread into the middle east by merchants travelling along the ancient Silk Road. Almonds reduce heart attack risk, almonds protect the artery walls, almonds lower blood sugar, almonds aid weight loss, build strong teeth, aid brain function, moderate the nervous system and support the immune system. What a surprise. All you readers who aren’t stuffing yourselves with almonds must be amazed you are still alive! Almonds may have come to Spain via the Romans (no not the Moors! They didn’t do everything!) who were very aware of their culinary merits and regarded them as an aid to fertility. Sugared almonds were given as wedding gifts and almonds were scattered like confetti at weddings. Spain is now the second largest producer of almonds in the world, and Andalucia makes the largest contribution to that crop. Almonds are a drupe, which means that they are part of the family of plums and peaches and like almost all fruiting trees, they are cultivated by grafting fruiting wood onto more vigorous growing wood called root-stock. The growing root-stock on a modern tree is likely to be peach, but our old Spanish trees are grafted onto bitter almond. Bitter almonds are produced by the wild almond tree, which is very vigorous. It is a sub species (Prunus amygdalus var. amara) of Prunus Dulcis and the little nuts taste bitter because they contain glycoside amygdalin. When eaten, glycoside amygdalin turns into prussic acid, which is hydrogen cyanide, the very theatrical and deadly poison popular in murder mysteries. We shouldn’t get carried away though, glycoside amygdalin is also present in apple pips and people who eat apples aren’t dropping dead. 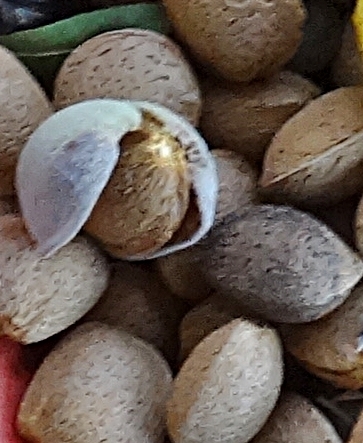 An adult would have to eat about fifty nuts to get ill, however it is illegal to grow or sell these nuts in the USA or the UK although they are very widely available in Spain. Here in the village one or two bitter nuts are put into the mix of ground almonds for that added almond savour. Bitter almonds also figure in herbal remedies for spasms, pain and coughs. Volatile oils not to be taken by mouth are made from bitter almonds and these oils can also be produced from all the drupes that are the other members of almond family including apricot (Prunus armeniaca), peach (Prunus persica), and plum (Prunus domestica). Like the bitter almond, all these fruit stones contain glycoside amygdalin and the volatile oils made from them are considered poisonous. Spain has a variety of sweet almonds. You can buy soft shell almonds these days but they are not Spanish. Spanish hard shell almonds are usually grown on dry farmed orchards and if, like ours they are on steep hillsides they are very difficult and dangerous to harvest. If you can find anywhere to lay an olive net, that’s the best way. Lay it round the tree and then beat the tree with a long cane. You always lose a percentage of the crop. Production from non irrigated trees is lower than on the large irrigated orchards, and sometimes our trees miss a year or produce every other year. But dry farmed almonds from the hills are of outstanding quality because of their high oil content which makes them moister and better flavoured. There are five main commercial types – Marcona, Largueta, Planeta, Valencias (Common Almond) and Majorca. The first three are native. We have a big Marcona tree, and this yields our favourite almonds – five or six kilos every year with no water and no care. Regarded by the Spanish as the best dessert nuts, they taste like butter and make California almonds taste like wood. Marconas are ground up and mixed with Spanish honey to make finest nougat. Foods and confections from almonds are almost too many to mention. Before they built the roads, ground almonds were a substitute for flour and as you would expect almond sauce is the ubiquitous dressing for any meat in the Axarquia, also the famous ajo blanco soup the “white gaspacho” is typical of this area. Many speciality almond biscuits and cakes are made here. Almond sweets with a hard white sugar coating called peladillas are a traditional Spanish Christmas treat. Spanish almonds are always used in the production of the highest-quality turrón and marzipan. At ferias and along the streets in winter arises the candy floss perfume of garrapiñadas, almonds coated with caramelized sugar. You can buy almonds roasted and salted on any street corner at any time of the year. Great article John – I enjoyed reading that. We have around 50 almond trees on our land, and I enjoy the annual cycle of the trees except for the leaf-fall which always seems to drift into our pool whenever there is a breeze! Thank you for your article! I have been studying the intriguing cycle of the almond tree. I am in the US and am interested in purchasing some of the raw almonds dry farmed in Andalucia. Would you be able to provide me with a source? Thanks for dropping by. I’m sure I could find you a raw almond source. I’ve no experience of shipping to the US. Willyour stae admit foreign fruit? I guess shipping costs would be high.